The article on Madras Trams (MM, February 16th) evoked pleasant memories of my childhood. A double track tramway passed through Westcott Road, opposite our house, linking Parry’s Corner/Broadway in the north to Mylapore/ Luz and beyond in the south. The typical clashing noise of steel wheels moving over steel rails and the clanging of bells of the trams were a constant “background music” those days. The nights were illuminated periodically by lightning-like flash of sparks emanating from the contact point of the current collector with the overhead wires. The tram driver standing in the front with his hand on a short throttle handle was a familiar sight. The best part of this eco-friendly mode of transport was that it merged so well with the pedestrian traffic. In fact, moving at little more than walking speed, the trams were like motorised pedestrians. You could get on and off it at will. Unlike their more energetic cousins, the buses, no tram ever overspeeded or went out of control. I do not think anyone ever got run over by a tram! It was indeed sad that it had to disappear almost overnight. The approaching tram could be one that commended Ovaltine for Good Health or Zandu’s Oriental Balm for All Your Pains or Woodward’s Gripe Water for Babies or Lodhra Ladies’ Tonic. Guessing them right, my younger  brother, who had this cognitive skill, beat me to it most of the time in this game. Incidentally, only Woodward’s of these once-celebrated brands seems to have survived the ravages of time. I should point out that ‘Lodhra Ladies Tonic’ is very much “alive and well”, along with many other Ayurvedic preparations, even 118 years after they were first introduced in the market by my grandfather Dr. K.N. Kesari when he established the house of Ayurvedic medicines ‘Kesari Kuteeram’ in 1900. The trust earned over more than a century is their most effective advertisement. I am writing to you as Director of the Max Planck Institute for European Legal History in Frankfurt, Germany – Europe’s leading research institution in legal history (http://www.rg.mpg.de/en). I am currently writing on William Holloway, Justice of the Madras High Court from 1863 to 1877. I am particularly interested in finding out more about his motivation for translating a book of a famous contemporary German Professor of Roman Law (Savigny: System of the Modern Roman Law, 1867). My hypothesis is that he wished to embellish his credentials because he was in the running for Chief Justiceship against his arch enemy, the then Attorney-General, Bruce Norton. I am interested in all archival materials, personal papers and professional correspondence pertaining to Holloway. Perhaps the publishers of Holloway’s translation (J. Higginbothams) might have kept records with regard to the book. I understand that they are still based at the same location where they were in the 19th Century. Any advice and ideas which you might have in this matter would be greatly appreciated. In Beat of Happiness (MM, March 16th), it should be noted that Kanchi Paramacharya’s life on earth lasted a hundred years between 1894-1994 and not as printed. A residential apartment in Saidapet, which has been recycling grey water for 16 years now, is an example for all Chennaiites, who are all too familiar with the problems of sewage mismanagement and water crisis. The apartment, housing eight households in Sri Nagar Colony, has adopted recycling by preparing the necessary infrastructure at the construction stage itself. Through separate pipelines, grey water is diverted to a bed of water-loving plants. Indukanth S. Ragade, a grey water recycling expert and author of a book titled Self reliance in water – A practical manual for town and city dwellers introduced the idea to the apartment dwellers around twelve years ago. The water then seeps into the layers of the soil and recharges the closed well which was built a few steps away from the plants. Explaining the procedure, Ragade says: “The plants can absorb water up to 5 cm deep within 45 minutes. There is no chance of stench.” The closed well is connected to three chambers of an overhead tank and can be used for non-potable, purposes including gardening and flushing. So what happens to the organics? Our bath soaps contain long chains of fatty acids that are biodegradable. Linear alkyl benzene sulphonate and Sodium tripolyphosphate, the components present in the detergents, are easily soluble. On average, a person uses one gram of toilet soap with 90,000 gms of water, which makes the compounds in grey water negligible. 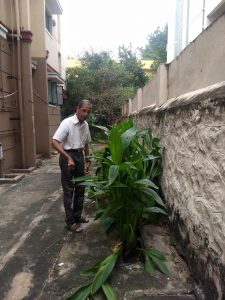 Indukanth points out that the roots of the indigenous plants including Canna indica, Heliconium and plantain, act as filters in removing these organics, while retaining the salts.Water then seeps into the layers of soil, where it goes through natural cleansing says Indukanth. However, the percentage of salts would remain the same. “500 parts of inorganic salts is ideal,” he suggests. Residents of the apartment admit that the procedure has been fruitful, and they have been able to reduce reliance on private water tankers. We have not accounted for the amount of water saved. But our ground water goes dry only during the peak summer season (around May), unlike in other apartments who have to start buying water from February itself,” said V.H. Prasad, a 92-year-old resident, who spearheaded the project in the apartment. Grey water (from sinks, bathtubs, washing machines etc) accounts for around 65 per cent of the household usage, while black water (sewage from toilets) amounts to 35 per cent. By recycling grey water, the quantity of water released to the underground sewage network can be reduced. “It is stupid to mix the resourceful grey water with the sewage, when you can recycle it in your own household. A lot of the government’s expenditure in running and treating sewage in the Sewage Treatment Plants (STPs) can be brought down, if grey water is not sent to the sewage-carrying pipes in our streets,” says Indukanth. In his opinion, the lateral movement (one-way outflow) of grey water which dominates the urban scenario should be replaced with cyclical movement (reuse/recycling). This, however, largely remains rhetoric in Chennai. The reasons cited by experts are the lack of awareness among civilians as well as government officials. A Metrowater official simply avoided the topic, stating that recycled water is unhealthy. A feasible solution now appears to be in the hands of the Chennai Metropolitan Development Authority and Chennai Corporation, if they make grey water recycling mandatory for all residential projects.